Auto Close Position is a strategy that will automatically close your position at a user defined time. A position will be closed using the NinjaTrader close algorithm. The user defined close time can be set via the "Auto Close Position - Time" property located in the Trading category of the General Options menu. 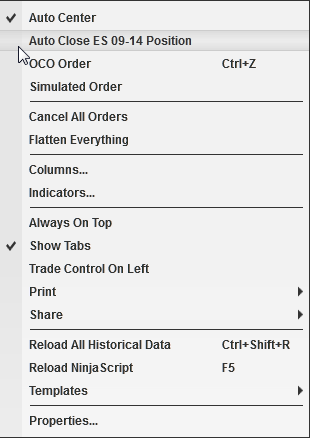 You can enable or disable this strategy via any NinjaTrader order entry screen's right mouse click context menu. Note: This feature not available to Direct Edition license users and will be disabled. Please contact [email protected] for upgrade options.